With the proper care, a stone floor, bathroom or marble or granite kitchen worktops can last years, decades or even centuries. However, it’s not always possible to avoid damage. The good news is you usually don’t need to replace your stonework – Surrey Marble and Granite can repair most damage. Surrey Marble and Granite are expert stone workers offering new products, maintenance and repair. As well as designing and installing a new marble kitchen worktop, we can also repair it, should damage occur, and perform the maintenance that keeps older stone looking fresh and new. Many people don’t realise that a lot of stone care instructions have more to do with protecting the finish of your stonework than the stone itself. A classic, highly polished worktop, for example, is hard to damage but the glossy finish can quite easily be dulled by abrasive products such as household cleaners or even lemon juice. While we always recommend that you mop up spills as soon as they occur, most damage to the finish and many stains only affect the top few millimetres of the stone. Instead of replacing the stone, an experienced stone worker can repair or redo the finish. This gives a new lease of life to a marble or granite kitchen worktop, restoring the original gloss or matt finish. As tiles are typically thin they are at higher risk of damage than a slab-laid stone floor or a worktop. Floor tiles are at most risk as it’s easy to drop something onto a tile, and a bit of bad luck can result in a chip or crack. Chipped and cracked tiles often have sharp edges, so it’s important to have the tile smoothed, even if you don’t want it replaced. Children and pets tend to be at most risk from cuts due to damaged tiles. Cracked bathroom tiles can also allow moisture to seep through, creating hidden water damage. Replacing a single tile is usually not a big deal, unless you have to find a match. It’s easier to match processed stone than natural stone. 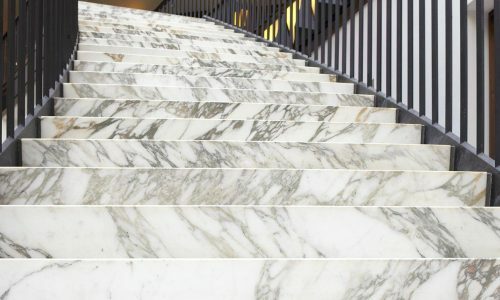 At Surrey Marble and Granite we source our stone from a wide range of suppliers, and are happy to help you find a creative solution, if you need to source a new tile to replace a damaged one. Unless there’s a structural issue, many cracks, even deep ones, can be completely hidden by repolishing and refinishing the stonework. For example, a marble or granite kitchen worktop that had split in half could be joined together again and then the crack disguised during the sealing and finishing process. Chips are harder to deal with as they require creating a filler that looks like the original stone. Natural stones, such as a marble or granite bath or worktop, typically has a great deal of variation in the colour and patterning. This makes filling a deep chip a challenge, but it’s not impossible. The key is to matching the colour accurately, which Surrey Marble and Granite are usually able to do, thanks to our extensive range of stone products, including a wide variety of marble or granite kitchen worktops.